The mat is suitable for the near side or off side. The rubber floor mud mats are made from a hardwearing rubber perfect for protecting your van interior from muddy and wet feet. The mud mats have a tray design which are designed to trap water mud snow and slush, leaving your carpets clean and undamaged. The deep tray all terrain rubber mud mats are ideal for cars, vans, pickups and 4x4 vehicles. The HD1MAT comprises of One(1) Front Mat. 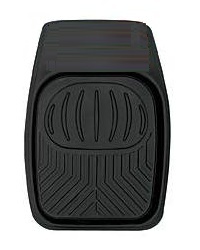 The front mats are 70cm x 50cm and incorporate a 2cm deep tray, and the outside edge of the mat can be trimmed to fit the front foot well shape of your vehicle if required. Anti slip nibbed rubber backing. Free delivery on all orders (See Terms and Conditions).